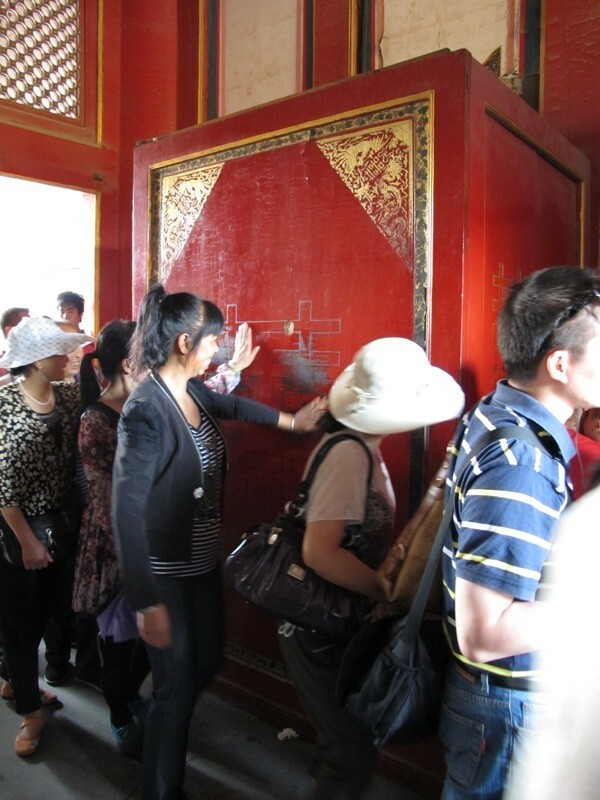 Travel: What it’s like to visit China — Gambling, Religion and Respect for Elders | Save. Spend. Splurge. Every temple I went to, I saw lots of people praying, lots of incense burning and reverence. I’ve never seen a culture so devoted to religion and taking care of the spirits. I’m an atheist, but I can appreciate how much religion permeates into their lives, thoughts and the culture as a whole. It seems to somewhat regulate their behaviours the way a lot of Western religion does to others, that perhaps the law might not. Of course, this doesn’t mean they don’t do bad things even if they are very devout, but it does give them a sense of community and greater being which I find lacking in Western culture. Religion for me, is a way for people to band together as a community, nothing more or less. It’s also quite a business. You can really see that they believe in luck, their luck, paying it forward, karma, and the whole shebang. These women were laughing and giggling as they smacked their hands into the symbol and rubbed it bare! This is a common sight — gambling everywhere. 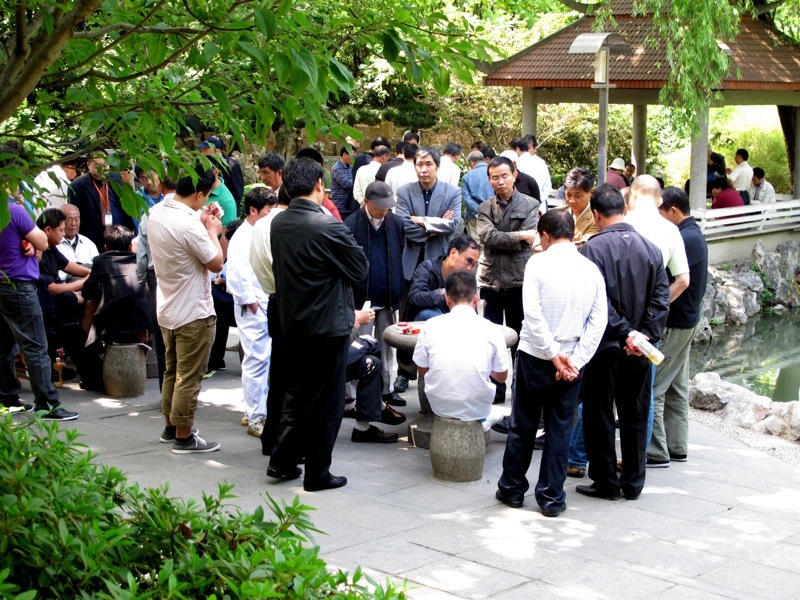 Groups, and groups in parks, all betting on cards or other things. I was a bit too scared to go up and watch the game because it’s all men and I didn’t want to intrude. It’s something Chinese people enjoy very much, even here in Canada. It’s a great past time. In Hong Kong, they’re into gambling too, with Macau being so close. 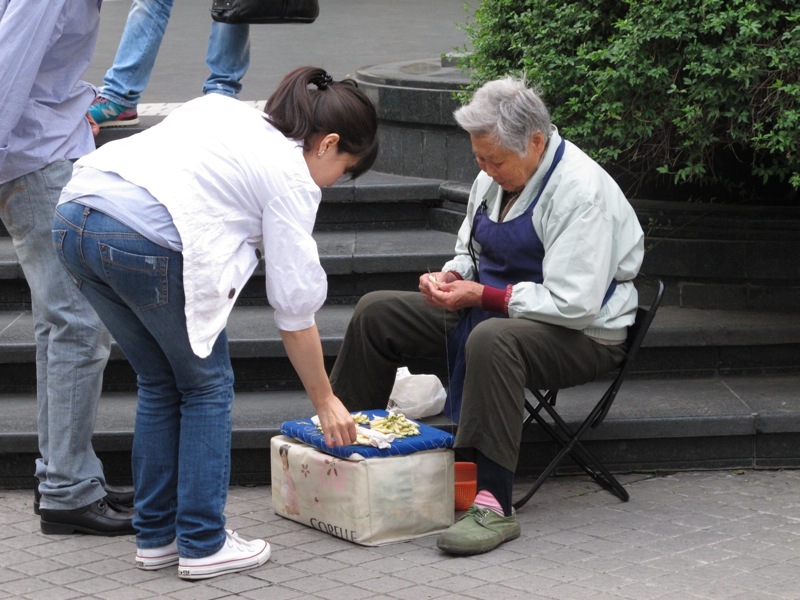 We in general are nice to elderly folks, but in Chinese culture, it goes farther than that. Subway trains are where you see young people leap up from their seats to offer it to older folks. I actually do this anyway, even in Canada, but it is not as common to see 2 or 3 people jump up and try to offer their seat to an elderly person, as it is in China. I never really see 2 or 3 people jump up, eager to let someone sit down. Elders are revered here, and children are held up on a pedestal. Any time you saw a child, you saw people smile and want to cuddle / touch the kid. It was really sweet. It’s a very 2-way street sort of interaction, because they have a sense that she or he could be their grandfather or grandmother, and they act accordingly. No one shoves them even for getting on a train, although I will mention that seniors have a mean elbow if you get in their way of getting to get the freshest eggs at a grocery store. I do too, because you get to see the good and the bad. There is virtually no respect for elders here in the US. I wish that there was more, but I do think it’s awesome that you are willing to give up your seat for older individuals! Well my mother is a senior now with a bad leg, so I just think of people who are like her… and I give up my seat. No biggie. Yes, Chinese is great believer of luck, lucky charm and other things that can bring them good luck. It’s nice to know that the young ones are very respectful with the adults.